Home » Laser Devices » HairMax Laser Devices » HairMax Review – Are The Lasercomb or Laser Devices Effective in Hair Loss Treatment? Find out from the Results! HairMax Review – Are The Lasercomb or Laser Devices Effective in Hair Loss Treatment? Find out from the Results! 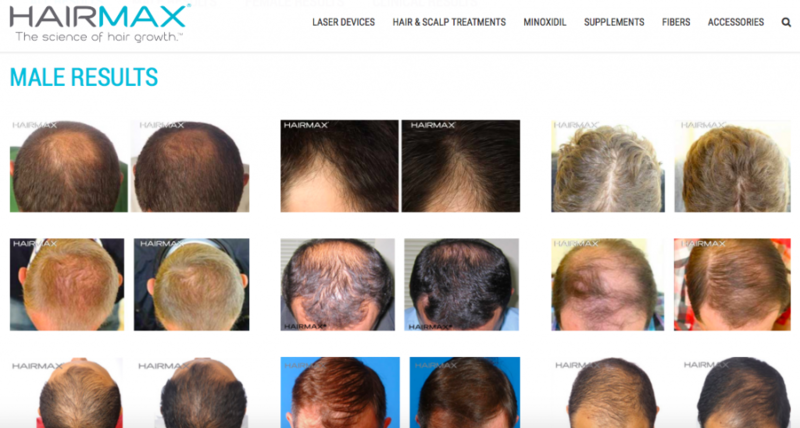 Looking for effective hair loss laser treatment devices, I stumbled over a hair loss solution brand called HairMax. Hair loss is a general problem that affects both men and women around the world. With millions, if not billions of dollars spent yearly in an effort to find a lasting solution, studies have shown that there is no permanent cure for hair loss. However, there are products marketed on the internet that really work as hair loss treatments (usually used continuously). 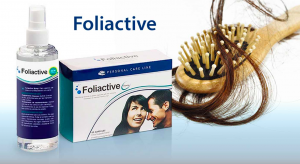 Conversely, a good number of these products in the online world have little or no effect in treating hair loss; one could refer to them as fake formulas. Now HairMax does have an official website with different categories of products that should eliminate hair loss and cause a healthy hair growth. But how do we know if the laser hair growth products are effective? There is a need to follow this review till the end. Grab some refreshment and follow down the review! HairMax is known to be a U.S based company/brand that manufactures different types of hair loss treatment products. Their hair loss treatment are said to be made based on years of research in line with the science of hair growth. 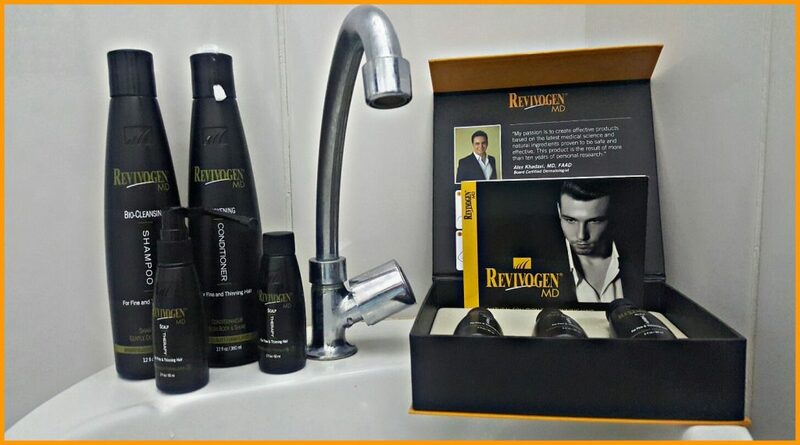 Their products includes Laser Devices, Hair & Scalp treatments, Minoxidil based formula, Supplements and Fibers. For the context of this review, we will be looking at HairMax Laser Devices (Laserband 82, Ultima 12 Lasercomb, Prima, Prima 7 Lasercomb and Advanced 7 Lasercomb). This is known to be the first generation HairMax Lasercomb. The company promotes that this device should treat hair loss and stimulate hair growth by delivering nourishing laser light energy to our hair follicles. It incorporates 7 medical grade lasers and it should be used three (3) times a week for 15 minutes. However, it seems it’s no longer available to purchase, since they updated and have launched a new laser device system. Keep reading ! This is marketed as an enhanced hands-free laser medical device that delivers nourishing laser light to energize and revitalize our hair follicles and re-grow our hair. It states to be the fastest laser treatment for hair loss with 82 medical grade lasers and patented hair parting teeth, which should be part of our hair daily treatment for maximum laser light delivery to our follicles to achieve optimal results. Yes, It is for men and women. 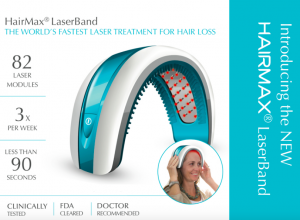 HairMax Laserband 82 should be used three (3) times a week for just 90 seconds. This, by employing HairMax clinically hair growth technology as well as a new iconic Italian design, by Pininfarina; is known to gently deliver nourishing laser light to our hair follicles to stimulate hair growth. It should reverse the hair thinning process, revitalize damaged hairs and produce a denser, fuller and healthier looking hair in just weeks. 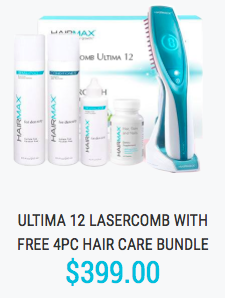 HairMax Ultima 12 Lasercomb is for both men and women. 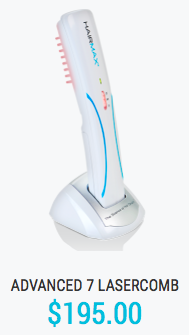 It contains 12 medical grade laser modules and should be used three (3) a week for 8 minutes. This is known to be a state of the art laser light medical device that targets our hair follicles with nourishing laser energy. According to the manufacturer, it treats hair loss and re-grows the hair. By using this device, we should experience new hair growth, increased density and healthier, fuller more attractive hair in just weeks. 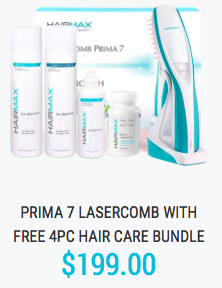 HairMax Prima 7 Lasercomb is for both men and women as well. It contains 7 medical grade laser modules and should be used three (3) times a week for 15 minutes. Now this is newest laser system that the HairMax manufacturer have previously launched. According to them, they introduced this new advanced device for fast, effectiveness and much more comfort when bringing new hair growth results. 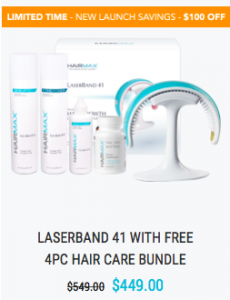 Reading through the product’s details, Laserband 41 comes with a total of 41 medical-grade lasers (not LEDs) to stimulate our hair follicles with speed for faster new hair growth restoration and of course, stop hair loss in us men or women. It features an exclusive, innovative Flex-fit band design to fit most head sizes and all I would have to do is use it for 3 minutes only and 3 times a week for effective, fast hair fullness and growth treatment. HairMax gave an incredible guarantee as they state to offer refunds (20% re-stocking fee applies) to unsatisfied users of any of their devices. That is, if within five (5) months of using any of the laser hair loss treatment devices we are not satisfied, we can confidently ask for a refund and be refunded. According to products’ official website (www.HairMax.com), the laser hair loss treatment devices are made with high quality medical grade laser; hence should be safe and effective for their intended purposes. These devices are made in certified U.S based facilities in line with the science behind hair loss. The company’s profile is available and they can be reached through the channels provided in their official website. HairMax as we have seen markets different types of hair loss treatment products on the internet. Their laser devices for hair loss treatment are known to be the state of art laser medical devices that should be effective in re-growing the hair. From my research, it is clear that these devices are FDA certified and are clinically tested for the intended purposes. Similarly, testimonials from previous users of the devices confirm that the HairMax laser devices have had great success in the hair enhancement industry, which there are testimonies from video, audio e even before and after results from photos found. I should make my personal opinion clear here! HairMax laser devices are novel discoveries and my research shows that this brand do stand behind each product of theirs. The devices are expensive, but I always remember the saying ; “we get what we pay for”, therefore we can surely expect results from the proof of evidence I have found regards to HairMax devices. Yet, not to mention we are covered by their incredible 5 month money back guarantee. Anyone who can afford any of the devices can use it because it is a real deal for treating hair loss and enhancing the hair. Plus, they introduced the newest exclusive Laserband 41 for speed, effectiveness and convenience. You can find out more by visiting the HairMax official website at (www.HairMax.com/Laser-Devices) to see the before and after evidence from results and go from there. Remember to drop your comments about your experience below. It would be my pleasure to hear about what you have to say. Previous Post Revita Hair Growth Shampoo Review – What Are the Reviews? Is There Any Side Effects? See Ingredients Here! Next Post Perfect Hair Health Review – A Complete Review from Before & After Results! eBook PFD Here! 14 commentsOn HairMax Review – Are The Lasercomb or Laser Devices Effective in Hair Loss Treatment? Find out from the Results! 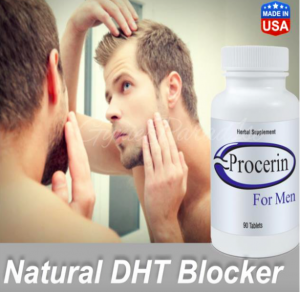 Yes, according to the product’s company, it is safe for all men and women to use as they have not mention any specific information in regards to using it after Chemo and radiation treatments. Laserband82 works like a charm!! It’s been 4 months and I see new hair folics coming up. I highly recommend! I’m debating between the Laserband 82 and the Capillus82. I’m looking for a comparison between them. So – Which is better? Forget about the discrete hat thing – we’d only use it at home. 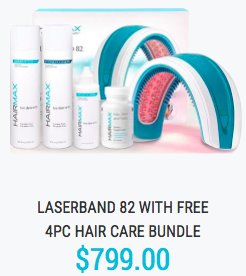 Well, both same price, but the LaserBand 82 Bundle comes with Shampoo, Conditioner, Revitalizer and a Dietary Supplement of pills for faster and better results, which the Capillus82 only comes with the laser cap. Other than that, results varies from person to person. Regards guarantee, HairMax covers with a 5 month money back guarantee and Capillus covers a year warranty. I must say, thank you julio. You have very interesting post here. It help me choose what I need. Awesome. That’s great to hear! Thanks for the feedback. I have heard good stories about hair max laser one. Saving up! I noticed it made a stop in hair loss. Some few new hair. Hey it at least its working. Will be back for a new review. That’s great to hear. I mean it’s working effectively in my point of view. I personally would continue to use the HairMax laser devices for at least 6 full months for visual results on hair growth.